The judge said Allan Shyback used reasonable force to fight off his wife until the couple both fell to the ground. CALGARY — A judge has rejected a Calgary man's argument that he acted in self-defence after years of domestic abuse when he strangled his wife and entombed her body in their basement. Justice Rosemary Nation found Allan Shyback guilty of the lesser offence of manslaughter rather than second-degree murder. The judge says not all of Shyback's actions were made in panic, but his intentions in killing Lisa Mitchell in Calgary almost five years ago weren't entirely clear. "He is left responsible for a culpable homicide,'' Nation said in her verdict Thursday. Allan Shyback testified he had been the victim of domestic abuse for nearly a decade and Lisa Mitchell had attacked him with a knife the day she was killed. Shyback, 40, testified he had been the victim of domestic abuse for nearly a decade and Mitchell had attacked him with a knife the day she was killed. Nation said the force Shyback used to fend off Mitchell, who was 31, was reasonable until the couple fell to the ground. "Once the couple was on the floor there was no suggestion Lisa Mitchell was capable or threatening with the knife. She was clearly overpowered,'' said Nation. Mitchell was last seen in Calgary in October 2012. An undercover police operation started in 2013 and ended with Shyback's confession and arrest in Winnipeg a year later. The judge said it came down to whether Shyback was guilty of second-degree murder or manslaughter. "The evidence raises a reasonable doubt in my mind that the accused had the intention to kill Lisa Mitchell or that he meant to cause bodily harm that he knew was likely to cause death,'' said Nation. 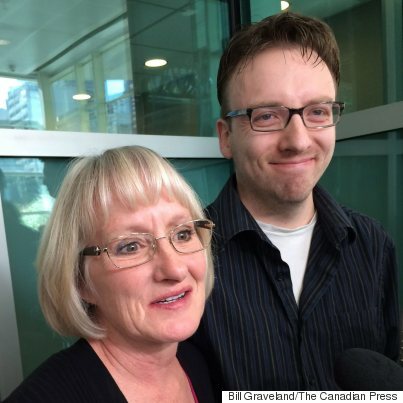 Lisa Mitchell's mother Peggy Mitchell and brother Ryan Mitchell react outside a Calgary courthouse on Thursday May 18. Shyback was also found guilty of causing an indignity to a body for putting Mitchell's remains in a Rubbermaid container and cementing it into a wall in the basement of their home. Mitchell's mother, who testified at the trial, said the result was probably as good as could be expected. "It's over. It's done. We can get on with our lives. I was satisfied with the decision and that was the best we could hope for,'' Mitchell said outside court. Mitchell was asked if she believed Shyback was a victim of domestic abuse. Prosecutor Jayme Williams will not appeal. "In this case we asked that he be convicted of unlawfully causing the death of Lisa and he was convicted of unlawfully causing the death of Lisa so in that sense the court has done what we have asked them to do,'' Williams said. Shyback's lawyer spent several minutes with his client after the verdict. "On one hand he's relieved that it's not a murder charge and he's so remorseful about this that he still feels so bad that it happened...that this young lady lost her life at his hands. He's agonizing over that part but he's certainly relieved that he's not guilty of murder,'' said Balfour Der. Sentencing arguments are scheduled for Sept. 20. The maximum sentence for manslaughter is life in prison. The maximum for indignity to a human body is five years in prison.